Delta Air Lines and Virgin Atlantic continue to steadily grow their trans-Atlantic joint venture with the expansion of markets outside the more competitive routes of London Heathrow to New York and Los Angeles. With the feed both airlines bring to the partnership, routes that would be unviable on a standalone basis are becoming promising. The latest addition is a new service from Delta’s smaller Salt Lake City hub to London Heathrow to be launched during the summer travel season in 2016. Delta is also launching new service from JFK to Edinburgh in conjunction with Virgin Atlantic during that time, resulting in new competition to American Airlines. Delta and Virgin Atlantic have quickly leveraged Virgin’s strong position at Heathrow to create an expansive trans-Atlantic network between the US and London, enabling the two carriers to close the gap with market leaders American and British Airways. At a bit more than a year and a half old, the joint venture is still in its early stages. But the rapid network changes initiated by Delta and Virgin Atlantic show the airlines are working to quickly spool up to the desired level of maturity for their tie-up. Delta spent USD360 million in 2013 to acquire a 49% stake in Virgin Atlantic from Singapore Airlines. After gaining the requisite regulatory approvals, Delta and Virgin launched their immunised trans-Atlantic joint venture in Jan-2014. The tie-up gave Virgin Atlantic an opportunity to exit some weaker routes and offered Delta the ability to fill in a gaping hole within its network, a significant presence in the UK market, particularly at London Heathrow. Virgin Atlantic has since expanded significantly in the US market as capacity from other markets has been redeployed. 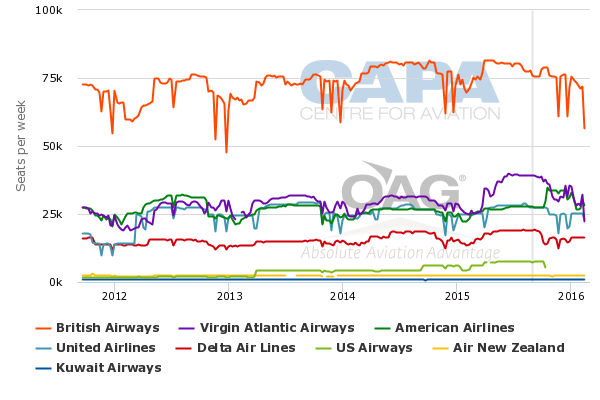 Over the last year Virgin Atlantic seat capacity to the US has grown by about 22%, according to CAPA and OAG data. Total one-way seats between the US and UK are up 9% year-on-year to about 256,000. Virgin Atlantic has been the main driver as it has posted the largest increase in capacity among the main airlines serving the UK-US market. American Airways seats are up 13% and its merger partner US Airways (now included in the one-world trans-Atlantic joint venture) has posted a 16% rise. But their oneworld partner British Airways has reduced capacity by about 5%. Delta’s seats are roughly flat. On a seat share basis, Delta’s share has dropped from 9% to 8% but Virgin Atlantic’s share has jumped from 20% to 22%. As a result the combined seat share of Delta and Virgin Atlantic has increased to about 30%. American’s share is flat year-on-year at 13% while British Airways’ share has dropped from 37% to 32% and US Airways’ share is flat at 4%. As a result the American-BA joint venture has seen its share drop to about 49%. Virgin Atlantic’s seat growth between London Heathrow and the US is even more pronounced at 25% year-on-year. 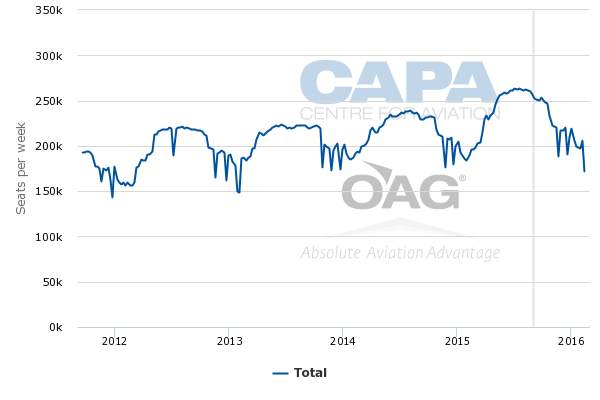 Overall one-way seats in the Heathrow-US market have grown 4% to about 200,000, according to CAPA and OAG data. British Airways’ seats are down 6% while American’s have grown 4%. US Airways’ have jumped 76%, but its overall share remains small at 4%. Delta’s seats between the London Heathrow and the US have increased by about 2% over the last year. On a seat share basis, Virgin Atlantic’s share has grown from 16% to 20% and British Airways’s share has dropped from 42% to 38%. American’s is steady at 14% and Delta’s share is also roughly the same, around 10%. Overall, oneworld’s seat share (including US Airways) between London Heathrow and the US has dropped from 58% to 56% year-on-year and the share of JV duo Delta and Virgin Atlantic has grown from 26% to 30%. Much of Virgin Atlantic’s seat increase between the US and the UK during the last year has been fuelled by cuts elsewhere in its long-haul network. The airline has eliminated flights from London to Mumbai, Tokyo Narita, and seasonal service to Vancouver and Cape Town. Virgin Atlantic transferred capacity to new service to Delta’s hub in Detroit, and added frequencies to New York, Los Angeles, San Francisco and Miami. It has also added flights from Manchester to Atlanta, a route the airline assumed from Delta. 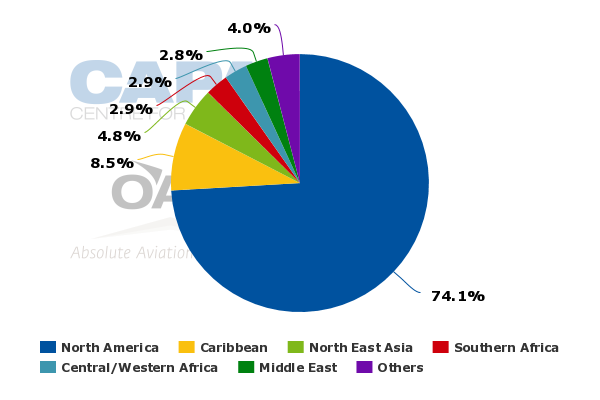 Previously, CAPA has concluded that in its summer 2015 schedule, Virgin Atlantic was deploying roughly 72% of its seat capacity to North America compared with 58% two years ago. 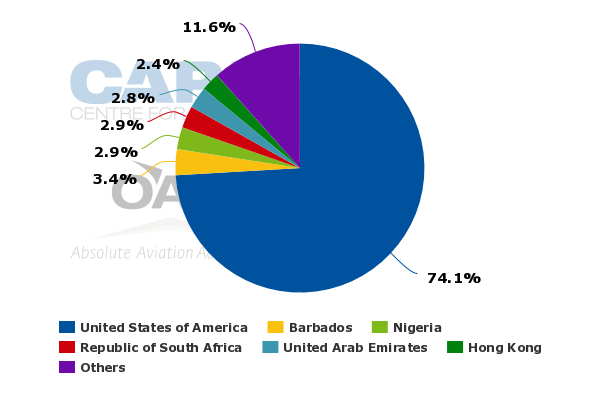 Data from CAPA and OAG show that for the week of 31-Aug-2015 to 6-Sep-2015 about 74% of Virgin Atlantic’s international seats are deployed to the US. During the 2015 summer season, Virgin Atlantic and Delta are operating about 39 daily return trans-Atlantic flights between the UK and North America, including eight daily flights in the key JFK-London Heathrow market and two between Newark and Heathrow. The partners also offer three daily flights between Los Angeles and London Heathrow. Notable routes that Delta has added since the joint venture’s launch include Philadelphia to Heathrow and New York JFK to Manchester. Philadelphia-Heathrow was already served by American (previously US Airways) and British Airways. American operates from JFK to Manchester and Thomas Cook also offers seasonal service on the pairing. Delta’s service offerings from the US to London Heathrow now include flights to Atlanta, Boston, Detroit, Philadelphia, Los Angeles, Minneapolis, New York JFK and Seattle. Virgin Atlantic currently serves 10 destinations in the US from Heathrow including Atlanta, Boston, Chicago, Detroit, Los Angeles, Miami, New York JFK, Newark, San Francisco and Washington Dulles. Virgin Atlantic also serves Las Vegas and Orlando from London Gatwick, Glasgow and Manchester and now operates from Manchester to Atlanta. Delta is adding seasonal flights in May-2016 to London Heathrow from its Salt Lake City hub, joining existing trans-Atlantic service from Salt Lake City to Amsterdam (seasonal) and Paris operated in conjunction with SkyTeam joint venture partners KLM and Air France. The new flight supports international expansion in Salt Lake City, where Delta reportedly aims to increase capacity by 8% over the next five years. The joint venture with Virgin Atlantic makes Salt Lake City-Heathrow more viable since Delta can leverage Virgin Atlantic in the UK market and market some connections beyond London using Virgin Atlantic’s Heathrow hub. But Delta will rely mainly on connections beyond Salt Lake City. Salt Lake City is one of Delta’s smaller hubs but offers connections throughout the western US. The financial services sector is also growing in Salt Lake City, which is also likely an incentive to link to London’s financial district. Operating seasonal service will give Delta and Virgin Atlantic some insight into traffic patterns, and if there is enough demand for year-round flights. Delta’s planned JFK-Edinburgh service seems like a defensive move after American launched flights on the pairing in the summer of 2015. United also serves Edinburgh from its Newark Liberty hub. Delta already served JFK-Manchester alongside American, so it seems as if Delta and Virgin Atlantic are ensuring they have blanket coverage between the US and UK to compete effectively with members of the oneworld trans-Atlantic joint venture. Of course, with the overall macroeconomic environment on shaky ground, it is not certain if some of the routes to secondary markets like Manchester and Edinburgh can absorb the capacity increases. American Airlines in particular has cited pressure from the capacity increases initiated by Delta and Virgin Atlantic and has worked with its joint venture partners to pull down some capacity in the trans-Atlantic market. But obviously American and British Airways will compete vigorously against the new Delta/Virgin Atlantic joint venture. Delta and Virgin Atlantic are off to a solid start. Can they sustain the momentum? The rise of Delta and Virgin Atlantic in the US-UK market has been swift, adding some challenge to the dominance of American and British Airways. But more importantly the joint venture has given Delta access to a strategic market that it was virtually absent from a few years ago. The tie-up also appears to be benefiting Virgin Atlantic as the airline turned a profit in 2014 for the first time in three years. Although it is still early days of the tie-up between Delta and Virgin Atlantic, Delta at the start of 2015 estimated that the partnership would produce a USD200 million benefit for the year. More than 4.5 million passengers flew on joint venture services in 2014, which should no doubt grow in 2015 given the increase in Delta and Virgin Atlantic’s joint offerings. Delta and Virgin Atlantic seem to have partnered at the right time, but there is much work to be completed before the project is deemed a success.